When you install Windows 10 for the first time, you’ll make a choice between using a local or Microsoft Account. Microsoft Accounts are a new feature, and Microsoft doesn't want you to use a local account in Windows 10. The wrong choice here may force you to miss out on the great features offered by Windows 10. Choosing a local account doesn't ensure your login will stay that way. If you log in to the Microsoft store or install any app with your Microsoft account, the login can convert back to your Microsoft account. If you've ever signed in to a home computer running Windows XP or Windows 7, then you’ve used a local account. The name may throw off novice users, but it’s nothing more than an account to access the computer as a default administrator. A local account works on that specific computer and no others. More secure: You create a complex password that works on one computer and nowhere else. Private: Your settings and computer use don't transmit to remote servers. Everything is stored locally on one computer. Internet-independent: A Microsoft login requires a connection to the internet to retrieve user settings and preferences. Custom login name: You don't use your email address as a login name, so it won't be displayed on the login screen when your screen locks. Choose a local account if you want to keep your experience like it was on previous versions of Windows. You’ll log in, change your settings, install software, and keep your user area separate from others on the system. However, you'll also miss out on a bunch of features made possible by Microsoft Accounts. With a local account, whenever you use Microsoft products like the Microsoft Store or Skype, you'll need to sign in with your Microsoft account. A Microsoft Account is a new name for what used to be called the Windows Live ID. If you've used services such as Xbox Live, Hotmail, Outlook.com, OneDrive, or Windows Messenger, you have a Microsoft Account. Microsoft has combined these services, providing access to them with a single email address and password. Having a Microsoft Account means you’ll have easier access to all of Microsoft’s various services, but using it with Windows 10 provides a few more perks. Signing in to Windows gives you access to the Windows Store where you can download apps to your Windows computer. These apps are similar to the apps found in the Google Play Store or the iTunes App Store. The difference is that Windows Store apps can be used on a PC. On Windows 10, the Windows Store apps can be used like regular desktop apps. You’ll find thousands of free apps in categories including games, sports, social, entertainment, photo, music, and news. Some are paid apps, but many more are free of charge, and they’re all easy to use. Setting up a Microsoft Account provides you with 5 GB of storage space in the cloud free of charge. This service, known as OneDrive, stores files online so you can access them from your other devices. Not only is your data easier to get to, but it’s also easier to share. You can give your friends and family access to files stored in your OneDrive account. With your permission, they can log in to view these files or download a copy. OneDrive also provides tools for editing your files using Office Online: a suite of simplified Microsoft Office programs for editing and creating documents stored in OneDrive. If you decide not to use your Microsoft Account with your PC, you still have 5 GB of free storage with OneDrive. Perhaps the most exciting feature of a Microsoft Account is that it stores your Windows 10 account settings in the cloud. When you log in to your account on one Windows computer and set it up the way you like, the changes are stored in the cloud through a process that syncs your desktop with OneDrive. A Windows 10 account makes sync even better by syncing network profiles, passwords, and Windows Store app settings between accounts. Windows 10 also makes it possible for you to share Wi-Fi passwords seamlessly in the background with your friends and colleagues. Hackable: Since your Microsoft account is stored on the internet, if it gets hacked, the hacker gains access to your computer and every Microsoft service you use. Internet needed: It is possible to login to your computer if you don't have internet access, but it requires an extra step to confirm that you want to use the latest saved settings. Shared password: If you share a Microsoft login with anyone so they can access the computer, they have access to all of your Microsoft services and any sensitive information stored there. Less privacy: Your computer settings are stored on Microsoft servers, along with your computer usage, sites you visit, and apps you use. Synced settings: If you use the same Microsoft account on all your devices, your settings are automatically synced across these devices. Getting locked out of your Microsoft account also means you'll get locked out of all the devices you use with that account. Thankfully, unlocking your Microsoft password is easy. Which Account Type Should You Choose? A Microsoft Account offers many features that a local account does not, but that doesn’t mean it’s for everyone. 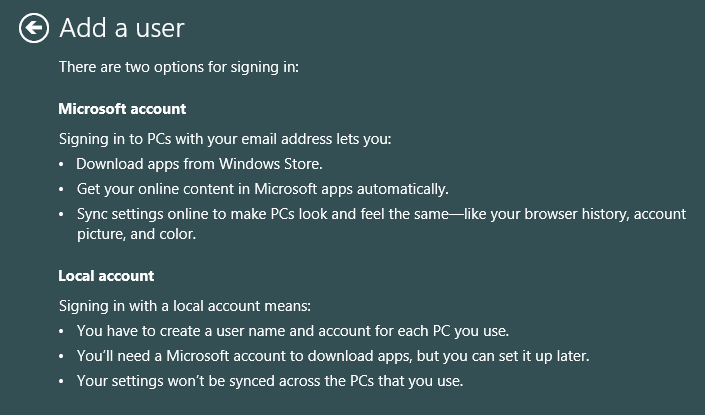 If you don’t care about Windows Store apps, only have one computer, and don’t need access to your data anywhere but your home, then a local account will work just fine. It’ll get you into Windows and provide you with personal space to call your own. If you’re interested in accessing all the features that Windows 10 has to offer, then you’ll need a Microsoft Account to take full advantage of them.